The UK is looking to claim sovereignty over a large area of the remote seabed off Antarctica. The claim for an area around British Antarctica is one of a number being prepared by the Foreign Office, a spokeswoman said. Even if granted, those rights would not allow Britain to contravene the treaty that prohibits oil and gas tapping under the seabed. The spokeswoman labelled the move "a safeguard for the future". The claim, which the spokeswoman stressed is still being prepared in advance of a May 2009 United Nations deadline, could extend Britain's stake for Antarctic waters by more than 1 million sq km (386,000 sq miles) and is permitted under the Law of the Sea Convention. "This has been under consideration for many years," the spokeswoman said of the move, which she said will not affect the more recent environmental protections put into the Antarctic Treaty in 1991. "It would be a claim in name only, we wouldn't act because doing any mineral exploitation contravenes the treaty." The move does signal Britain's willingness to join the current rush by countries to try to secure their potential oil and gas rights to seabeds should circumstances change. The most notable recent example was the claim by Russia over the Arctic seabed. "It is essentially to safeguard for the future and if (the treaty) is abolished in the future we will have safeguarded our claim to that area," the Foreign Office spokeswoman said. 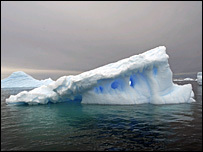 She added that any change to the ban on mineral exploitation in the Antarctic is "highly improbable". A spokesman for Greenpeace called the move "colossally irresponsible" and accused the British government of putting more effort into securing future oil rights than battling climate change. "When the UK is supposed to be leading the global charge on reducing carbon emissions, they are in fact leading the charge halfway around the world for a new oil rush," said Charlie Kronick. Currently, five-sixths of the Antarctic continent is claimed by seven countries and most of the existing British stake is also claimed by either Argentina or Chile. The British Antarctic Territory claim fans out from the south pole in a wedge that takes in more than 600,000 square miles. The area was first staked in 1908 and the Foreign Office says it now houses two permanent research stations. Britain has already submitted to the United Nations a joint claim with France, Spain and the Irish Republic for part of the Bay of Biscay. It is also in discussions with Iceland, Ireland and Denmark on a joint claim in the Hattan-Rockall area off the west coast of Scotland and is working on a claim to extend around the Falkland Islands, South Georgia and Ascension Island. "There are a number of coastal states submitting claims," the spokeswoman said, adding that the technology does not yet exist to reach mineral deposits that can sit as far as four or five miles under water. The deadline for submitting claims, which can be made for up to 350 miles (563 km) off existing territories, is May 2009. Researchers are currently compiling the geological case for the submissions, since under the Convention, any extensions must be based on the existence of continental shelf. Polar explorer Pen Hadow, is the guest on the Have Your Say programme on Sunday 21 October 1406GMT. He has been to the North and South Pole and next year he is returning to the North Pole to measure the ice cap. You can send your questions for him using this post form.